Need assistance to find probable customers – Resort to Predictive Intelligence!! Predictive Intelligence is gaining momentum and for obvious reasons. After all in today’s business scenario who does not wish to know about the new business opportunities. The aim is to transform data into information and gain an insight into who could be the future customers. Predictive intelligence solutions help harness the influx of information and deliver seamless customer experience. So what actually is Predictive Intelligence? Predictive Intelligence is known by several names, like Predictive Analytics, Predictive Recommendations. Predictive Intelligence is the process of first collecting data on potential customers, their behaviors/actions from various sources and then combining it with profile data about their characteristics. It uses algorithms to deliver content based on estimates of what the customer wants. It actually anticipates the customer requirement and then recommends products based on the observation. Machine learning technique helps identify the likelihood of future outcomes based on historical data. Prediction for Business – A Growing Trend! Predictive analysis scores over traditional lead identification tools as specific targeting increases lead conversions. When added with Salesforce marketing cloud Predictive analysis has great potential to provide huge return on Investment. 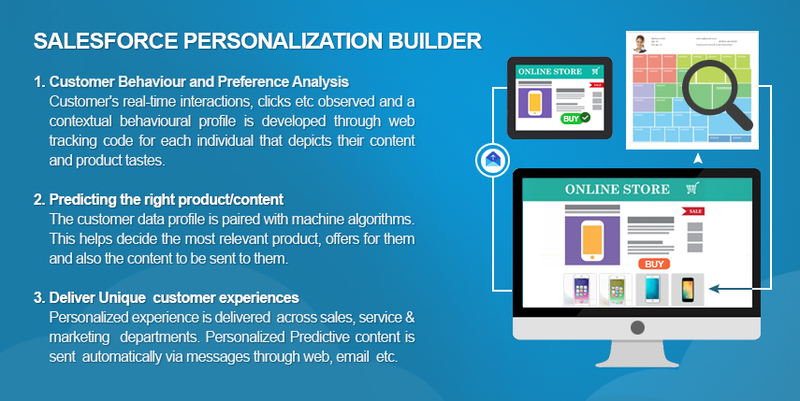 Now let’s have a look at the Salesforce’s solution for Predictive Intelligence..
Salesforce Introduced Personalization Builder for marketing cloud to drive personalized digital experience and boost returns on the marketing effort. This Predictive analytics software helps learn each customer’s preferences and automatically provides them with personalized recommendations and offers. This helps attract potential customers and drives business. 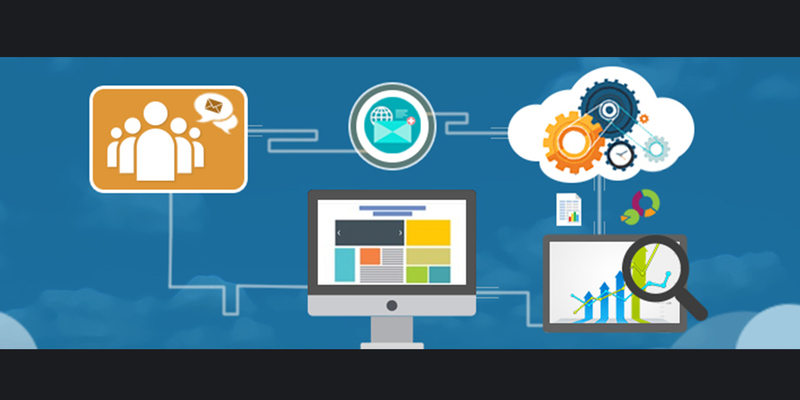 Salesforce personalized marketing tool – Personalization Builder, powered by Einstein utilizes the power of Predictive analysis and predictive modelling to understand customer preferences and automatically personalizes the content to be delivered via email, mobile apps etc. After the predictive lead scoring identifies the qualified leads, predictive analysis pairs the customer data profile with machine algorithms and helps decide the personalized content, products, offers that would be required to be sent to them. Predictive analytics also leads to idea generation and appropriate content development as per the customer’s requirement. However for the success of content marketing, it is very essential to decipher which content would generate high-level interest in the consumers. Also marketers lay an important role of going hand in hand with predictive analysis, doing wise analysis of the content in order to maximize business results. Content driving maximum engagement, could act as a turning point in conversion of quality leads to customers.